Well a busy week or so. I have been concentrating on the beginnings of a few urban paintings, one of which I much to my surprise completed. When I was working out in the west of London a few years ago one of the quickest ways to travel meant cutting through the City of London in order to change from overground to underground. At a certain time of year in the winter the commuters are arriving as the dawn breaks, which makes for some wonderfully dramatic moments with the low light glancing down the streets and picking out the grand buildings and glinting on the busy traffic. I have snatched a fair few photos over time which I want to combine to catch the early morning mood. 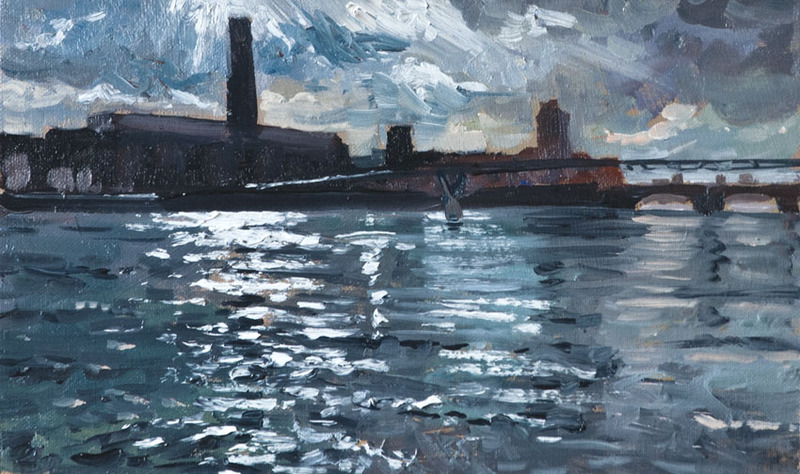 Earlier in the week I had the honour of being a guest to paint with the Wapping Group of painters, who since the 1940’s have painted the Thames and surrounds. 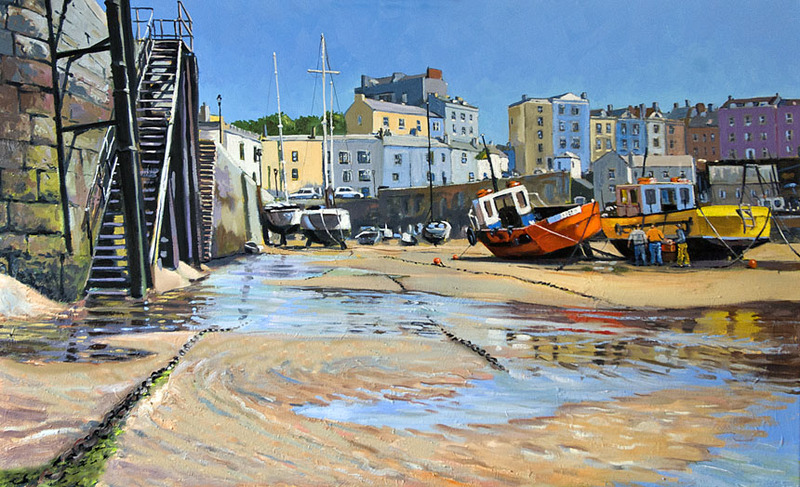 Many very fine artists have painted with the group over the years the present members being no exception. (I have added their web page to my links section on the right) As luck would have it the weather was merciless raining steadily from a mostly flat grey sky for most of the day. But the members sallied forth none the less to paint whatever the day had to offer. I did a quick oil before the weather totally closed in, and a couple of sketches. 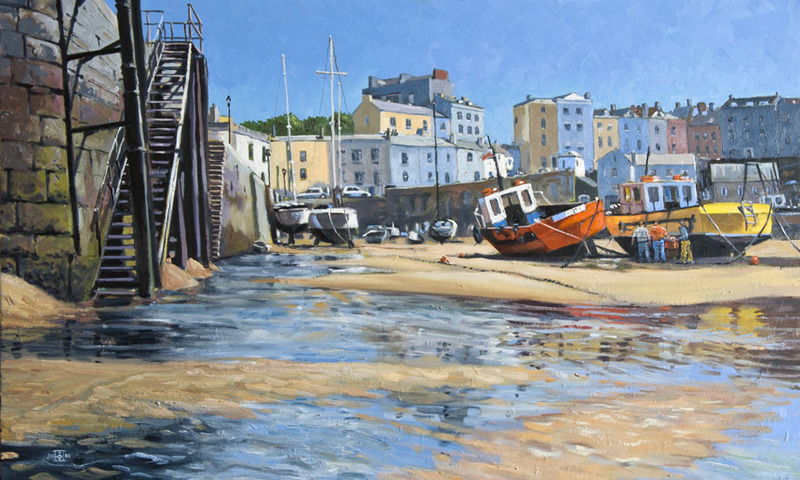 After painting we all took refuge in the pub to recover, it was a great pleasure to go out with them, painting is often a solitary business and it was a great pleasure to go out and paint the river in like minded company. Firstly though my street scene painted in my nice dry studio! I had great fun painting this, it is made up of quite a few references shot at different times combined with a few figures I had sketched or snapped. You can see from the image it is still very wet, but I was pleased to have got the most out of the range of tones to suggest the morning light on the buildings. The hardest bit was finding traffic that fit the bill and I ended up going up to town to take more pictures. I don’t often use black but here I have on the nearest figures to bring them forward. I put a fair amount of time into arranging the composition to bring the eye eventually to the main figure. It is the the people that give the city it’s vibrancy, but also I wished to catch the almost contemplative feeling that is often present as people make their way to work. On my day out with the Wapping group I arrived a little early to see what was on offer as far as the scenery went. The group was meeting in Wapping itself which I hadn’t visited for quite a while. There are still a fair few interesting bits left not swallowed up in ghastly riverside flats. 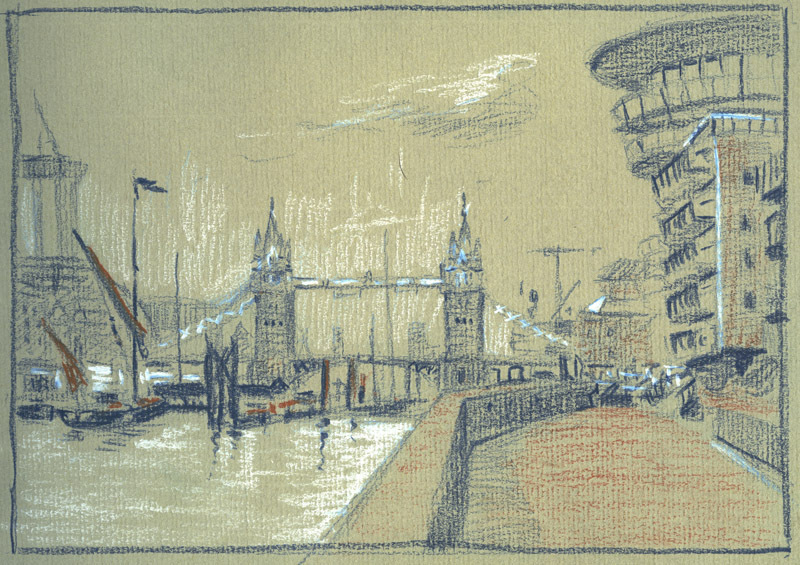 While waiting I did this quick sketch of Tower Bridge, though I won’t paint it, there are probably enough paintings of this iconic scene in the world already. The light was very flat and dull, but I was to find this was to be the best of the day! After meeting up with the group we sallied forth into the wet. I set up looking into the light at the mooring that lies in the river just east of Tower Bridge. Painting was distinctly tricky with the need to hold my umbrella over all to keep out the rain, unfortunately with the wind I could either protect the job in hand or myself so I was left with the water trickling down my neck. Even so it was an engrossing subject and I was soon lost in the process The wind had got up so the quick flowing water was ruffled by the wind which I felt made a great partner for the grey ragged clouds being chased across the sky. One brush was lost to the river, knocked in as I juggled palette, brushes, paints and umbrella, it was with a certain amount of relief I returned to the pub to imbibe whisky fortified coffee. 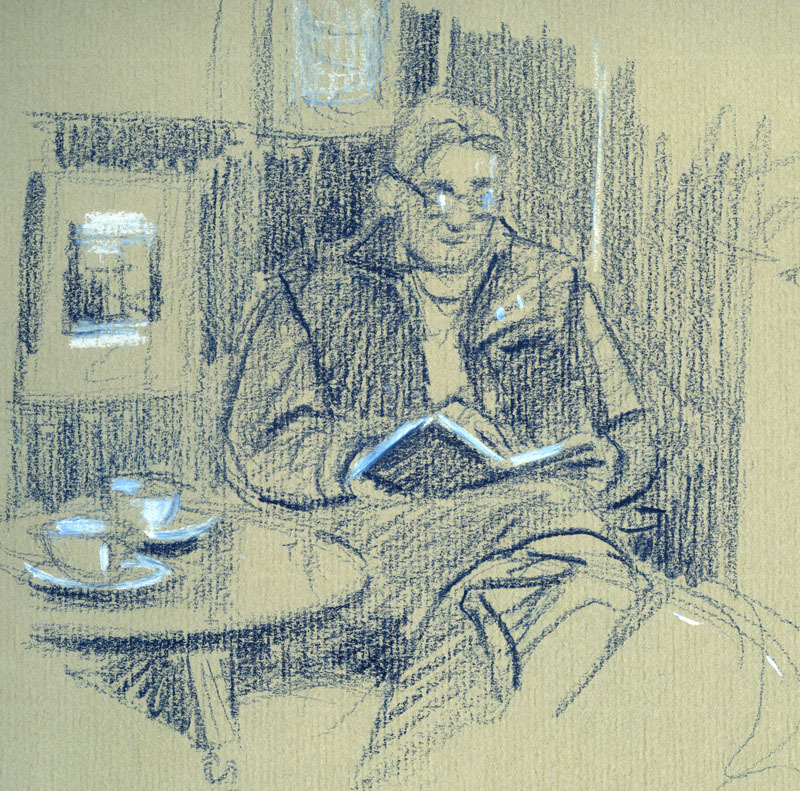 Various members of differing degrees of dampness trickled in and sketched each other whilst bemoaning the rain. I did venture forth again, but the the painting this time was not a success alas, a fine day out despite it all though and I hope to join the group again for an expedition later in the year. Due an update I guess. 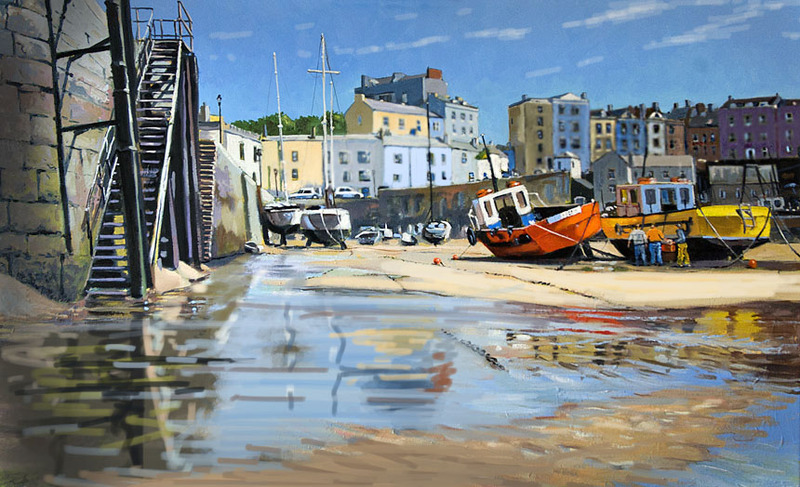 I have been struggling all week with a painting based on a sketch done in Tenby. It is larger than I usually paint and after a week and many changes is still not right. But at a certain point you have to back away and leave it to return to with a fresh eye. It is a time of day I always find difficult, full sunlight with a beautiful clear sky is I find the hardest of times to portray. Give me a nasty wet and stormy day and I am far happier! To clear my head I went out to sketch and paint up in the City of London. 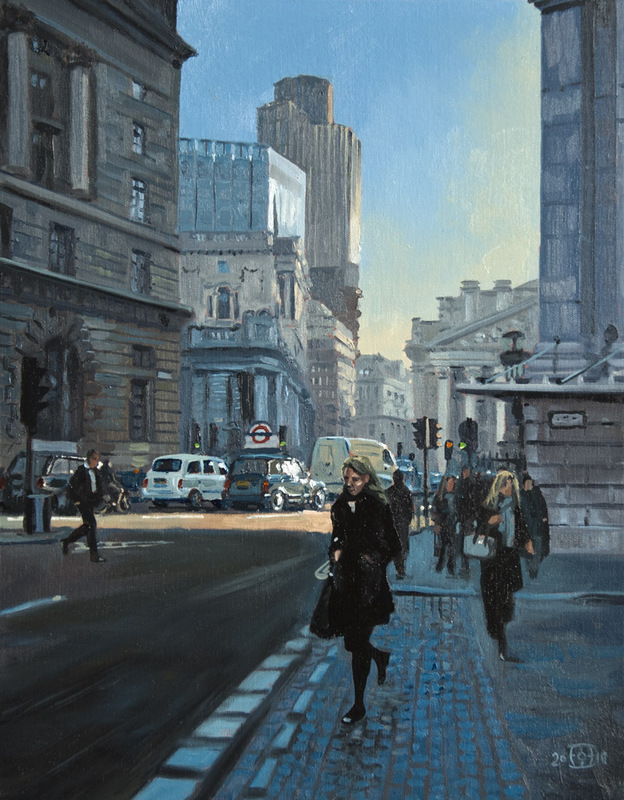 I have been meaning to paint a morning in the city subject for some time, so this was by way of an information gathering exercise. When I got to Cannon Street I was in luck the light was streaming down the road and transfiguring the scene. I snapped as many photos as I dared being in fear of being arrested as a terrorist… man with bulky green rucksack taking photos of commuters! 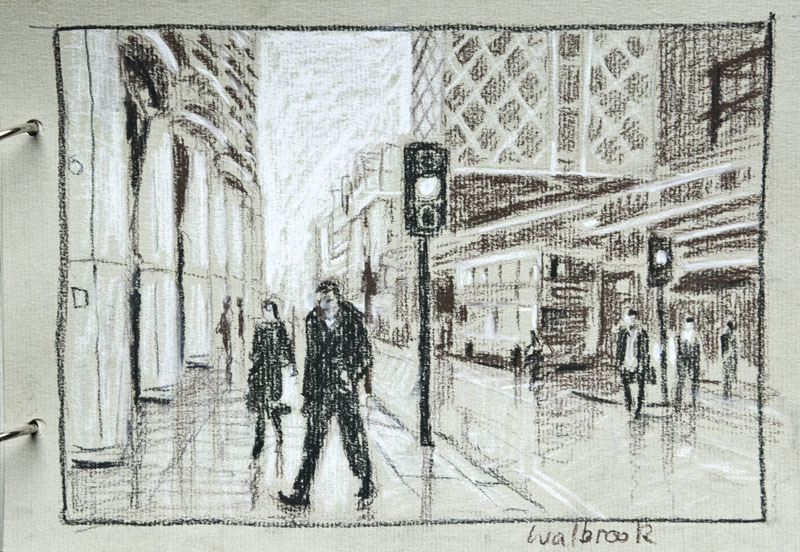 I did a few very quick sketches of the road, traffic and some of the people before the light went over. I passed a pleasant hour by the Tower sketching the tourists and invigorated by this I went on down to the river which was looking beautiful, all dramatic clouds and sparkling water. I had to wait a little while for the light to move round but at about four it was perfect and the painting didn’t take longer than 20 min. 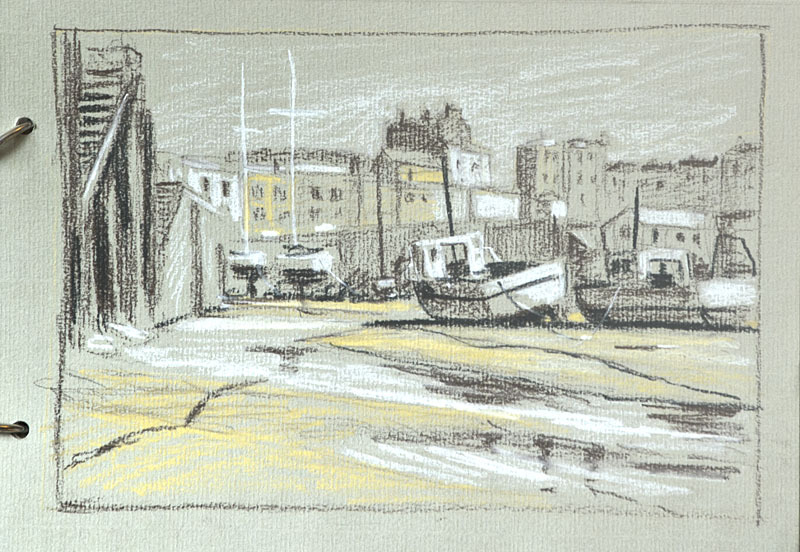 In a fit of enthusiasm I hiked back along the south bank of the Thames stopping to sketch on the Deptford Strand. It was as they say a “Grand Day Out”. But first Tenby. Here’s the sketch of the scene only about 15 min, I tried to catch the feeling of the scene without too much detail. 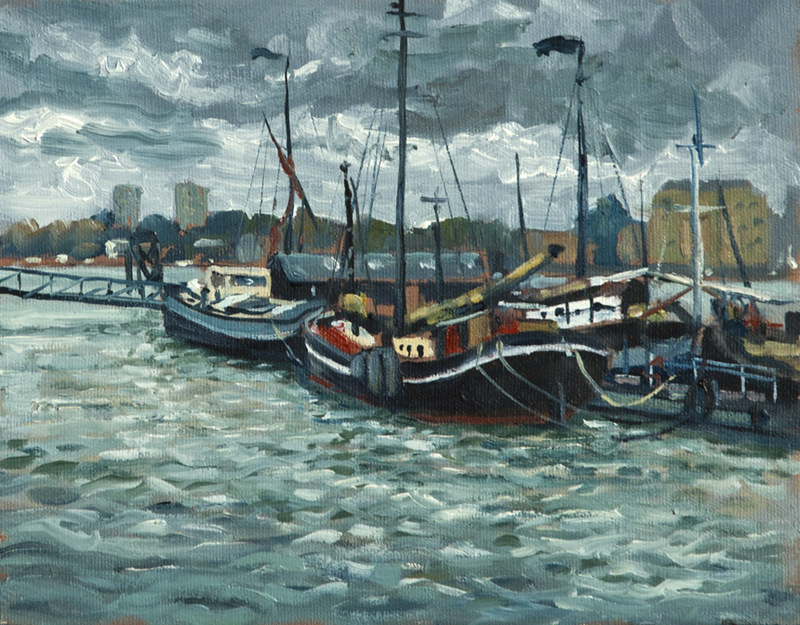 I had just sat and painted the boats from the other side so I didn’t feel like sitting again to paint. Here is the studio painting which after much changing around is still not what I want. I will leave it for a while to consider. then I will either scrub it out or make some dramatic (and risky) changes. Before doing this I will take this image into Photoshop to explore the options, this is one area where I find the computer very useful as I can explore various possibilities. Here it is after being mistreated in the computer. Better I feel, but more still to do! Here’s where I’m leaving it the foreground is still unresolved alas. I’m tempted to add some figures as a focus in the mid ground as the whole picture looks rather like an attractive but empty stage set waiting for the star of the show to arrive! It is always very hard to judge whether a picture that doesn’t work to your satisfaction is actually irredeemably flawed, or if some addition, exclusion or other alteration will take it over the divide from poor to good. It can sometimes just be that the actual picture just doesn’t fit your initial ambitions. Like a cuckoo in the nest it has fledged into a bird of a different feather than you hoped. I will leave it for now so that time can set me at a distance from it allowing more sensible judgement than I can muster at the present. Hopefully it will return in a later post reborn! Here’s the scene outside Cannon St station. I wished I had some darker toned paper but on the upside the bus had conveniently broken down! It is hard catching people in quick sketches the best way I have found is to try and get an interesting silhouette and just suggest the rest. The Street was dry alas but I pretended it wasn’t. I walked down to the Tower but didn’t fancy drawing castles so I sat and sketched the tourists. 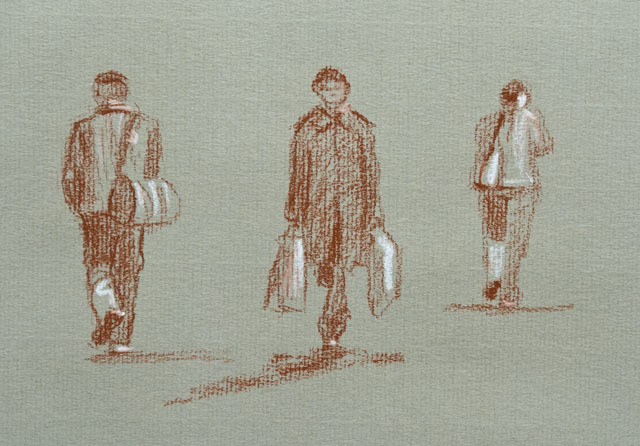 I don’t do this often enough, but the little sketches of figures are very useful to add to paintings. 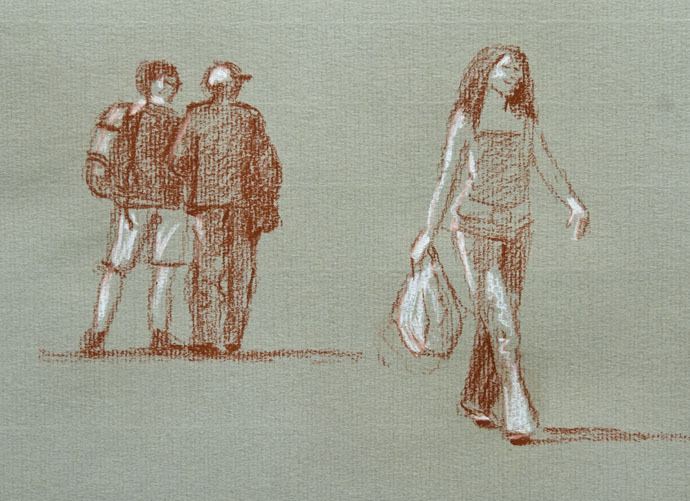 When people are on the move the drawings have to be more imagination than observation but it’s surprising how often they catch a certain something that imagination alone wouldn’t give. I’ve tried to get these ones actual size, they literally only take a minute each. After a bit more wandering I got to the river and the wobbly bridge. The light was just fantastic, sometimes the scene looks so dramatic that you just know that the sketch will be good. It is just nerve racking trying to catch it all before the light changes too much. I have to force myself to be systematic and not panic. I took several photos but when I looked at them they just didn’t catch the mood which shows how important plein air sketches are. 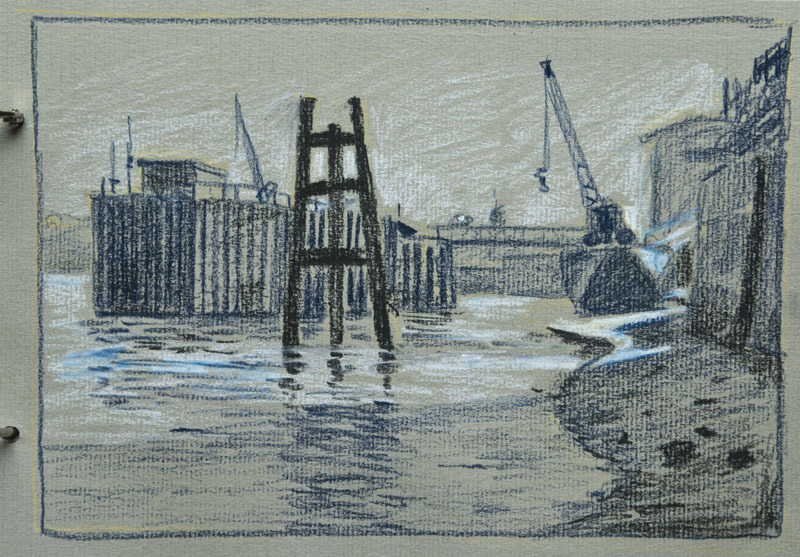 On my trek back I stopped to sketch on the foreshore at Deptford Strand, most of which alas is uglified by horrible flats built too close to the river. Architects, planning authorities, and developers should all be lined up and shot (metaphorically of course! ).